One of the first questions people ask me when they hear about my long distance motorcycle travels is “But don’t you get tired riding a motorcycle all day?” Sure I do. Pain is part of the experience. But having said that, I do want to talk about a long distance riding technique that has been working for me pretty well. I got started with long distance motorcycle touring when I bought my Royal Enfield Thunderbird 350 back in 2012. I started out with day rides with a group of friends and then slowly started indulging in two day rides in which we used to ride for one day, spend the night at a hotel and then ride back home the next day. My first proper multi-day ride was the one from Chandigarh to Leh weaving through the mountains of Ladakh. That was a six day long ride in difficult conditions and by the end of it I was pretty much wiped out. 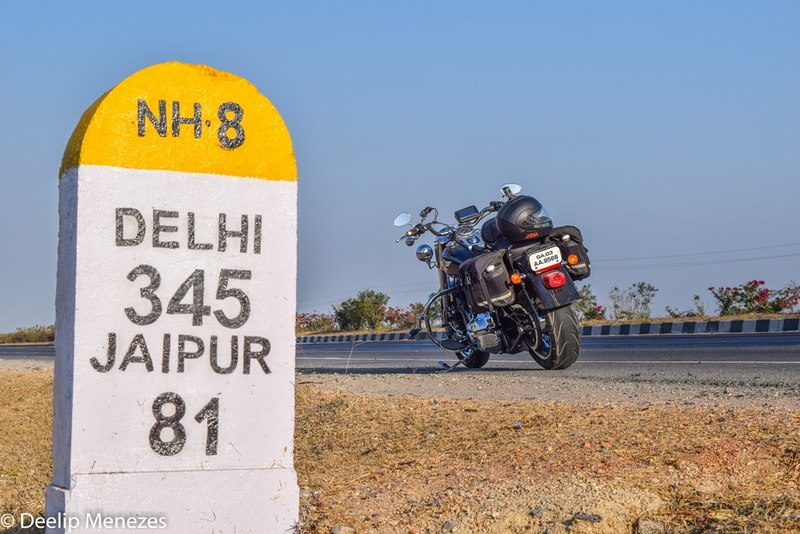 Then last January I decided to ride my Harley-Davidson Fat Boy around the Golden Quadrilateral, covering around 6,500 kms in 14 days. I wanted to enjoy every day of the long ride and didn’t want the fatigue of riding a 350 kg motorcycle day after day come in the way. So I decided to take a closer look at my riding style and do some introspection. I realized that on day long rides, we rode for two to three hours straight without stopping for a break. The logic behind this was in the morning we were fresh and it made sense to cover as much distance as possible before stopping to rest. We used to stop and spend at least half an hour or more having breakfast, resting and recharge our batteries. Then continue riding another couple of hours and again stop for a break. By the time it was time for lunch, we were completely exhausted, hungry, somewhat irritated by the hot sun and couldn’t wait to park our bikes by a restaurant and have a meal. Lunch was usually a one to two hour long break depending on the temperature. After lunch the stops became more frequent and we were forced to make them short in order to be at the destination on time. The final hours of the ride were usually painful and by the time we reached the destination we were all but finished. The problem with this style of riding was we were stopping to rest only when our batteries had drained out completely. Which is also why we needed to stop for a longer time to recharge. A week before I set out for the Golden Quadrilateral I decided to do a test. I loaded up my Fat Boy and rode from Porvorim to Satara and back, a total of 700 kms. When I returned home I joined my wife for a hour long 5 km walk around our neighborhood and was pleasantly surprised to feel a little tired, but not exhausted, like I had expected to be. What I did differently that day was ride for an hour and then stop for five to ten minutes. I did this repeatedly and consistently. I rode by the clock. Even if I didn’t feel like stopping, I used to stand the bike at the side of the highway, leave the engine running, stretch myself for a while, get back in the saddle and continue riding. I found that I didn’t need to rest for more than ten minutes because I was not completely drained out. Lunch break was just half an hour. I was ready to resume riding after I had finished my meal and didn’t feel like resting for a longer time. I actually ended up covering 700 kms much faster than I would have if I used my usual technique of riding till I was exhausted. After riding the 700 kms I still had the energy and will to walk for 5 kms, which says a lot. I used this technique for all the 14 days of riding the Golden Quadrilateral. Every night I reached the hotel tired, but not exhausted. I had the energy to walk around the hotel or courtyard and talk to people and not lock myself up in the room and order room service. The next morning I was completely fresh and ready to ride another 400 to 500 kms. This made the 14 days of riding solo around India quite enjoyable and safe as well. At no point in the 14 days was I exhausted to a point where my concentration and judgment was impaired. I hope this technique helps you enjoy long distance motorcycle touring as well.